This booklet is an output from the PLOTINA (Promoting gender balance and inclusion in research, innovation and training) Project, and in particular the Summer School on Peer Review, hosted by the University of Warwick in 2018. 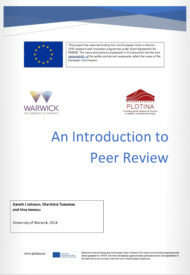 Like the summer school, this booklet represents a brief guided introduction to the concepts of peer reviewing, and discusses the associated practical processes, along with offering advice on dealing with some of the related challenges. Report of the contributions of international experts (as members of several editorial boards and peer-reviewers) informed the RPOs regarding the overall design, content and organisation of the summer schools, within the two Summer Schools focused on the topics “How to be a Peer Reviewer?” and “How to be an Editor/member of Editorial Board?” planned by the PLOTINA Consortium (2018 and 2019). 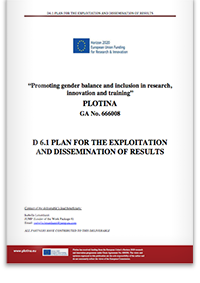 This document illustrates the Plan for the Exploitation and Dissemination of Results and sets the stage for PLOTINA’s communication and dissemination activities. 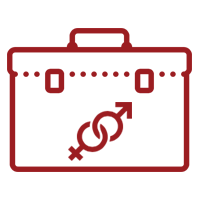 It provides the general communication strategy for PLOTINA, as well as a draft plan for the actions that will be taken all along the duration of the project. 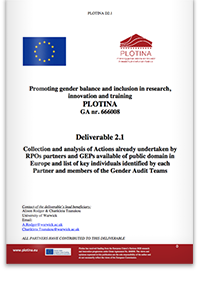 One of the first actions of the project was to agree definitions on Gender Equality, Work-Life Balance and Culture to ensure that all partners have a similar ‘working’ language with a common understanding of the concepts within the PLOTINA project. 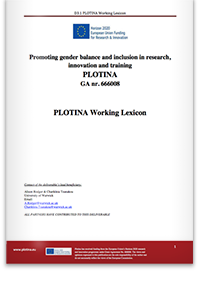 The methodology and the agreed definitions of key concepts can all be found in the deliverable: D3.1_PLOTINA_Lexicon.pdf, that can be downloaded by clicking on the button below.